The VAR-SOM-AM33 is a low-power, low cost and high performance System-On-Module which serves as a building block and easily integrates into any embedded solution. 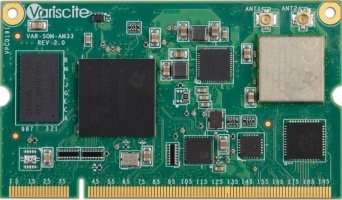 It includes an extensive range of interfaces and communication protocols and is ready to run any embedded operating system such as Linux and Windows Embedded CE. 20/10/2016: VAR-SOM-AM33 Yocto Krogoth is released. 12/09/2015: VAR-SOM-AM33 Yocto Fido - Kernel 4.1 - BETA is released 18/03/2015: VAR-SOM-AM33 Yocto Daisy (1.6) VAR Release 3 V8 is released. 12/03/2015: VAR-SOM-AM33 Yocto Daisy (1.6) VAR Release 3 V7 is released. 24/02/2015: VAR-SOM-AM33 Yocto Daisy (1.6) VAR Release 3 V6 is released. 17/02/2015: VAR-SOM-AM33 Yocto Daisy (1.6) VAR Release 3 V5 is released. 01/02/2015: VAR-SOM-AM33 Yocto Daisy (1.6) VAR Release 3 V4 is released. 14/01/2015: VAR-SOM-AM33 Yocto Daisy (1.6) VAR Release 3 V3 is released. 29/12/2014: VAR-SOM-AM33 Yocto Daisy (1.6) VAR Release 3 V2 is released. 04/12/2014: VAR-SOM-AM33 Yocto Daisy (1.6) VAR.V3 Beta is released. 26/10/2014: VAR-SOM-AM33 Yocto.VAR.V2 is released. 14/09/2014: VAR-SOM-AM33 Yocto.VAR.V1 is released. 06/04/2014: Linux SDK 7.0 beta is released. This page has been accessed 83,267 times.